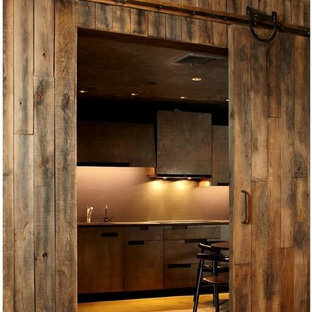 Photo of a country kitchen in San Francisco with medium hardwood floors. Photo of a large transitional l-shaped kitchen pantry in Orange County with an undermount sink, recessed-panel cabinets, white cabinets, granite benchtops, stainless steel appliances, medium hardwood floors, an island and subway tile splashback. Mid-sized traditional single-wall separate kitchen in Chicago with a double-bowl sink, shaker cabinets, dark wood cabinets, granite benchtops, multi-coloured splashback, cement tile splashback, stainless steel appliances, dark hardwood floors and an island. 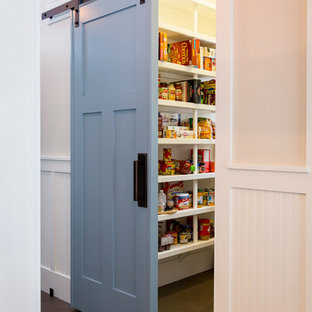 Design ideas for a beach style kitchen pantry in Other with dark hardwood floors. 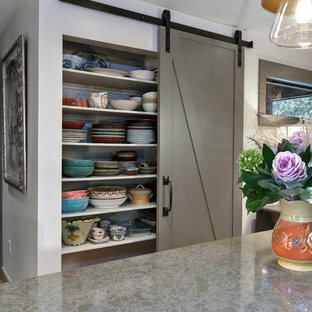 Inspiration for a transitional eat-in kitchen in Los Angeles. This is an example of a small contemporary u-shaped separate kitchen in Chicago with flat-panel cabinets, white cabinets, solid surface benchtops, white splashback, matchstick tile splashback, stainless steel appliances, dark hardwood floors and an island. Design ideas for a large country eat-in kitchen in New York with flat-panel cabinets, an undermount sink, solid surface benchtops and concrete floors. Traditional kitchen in Portland with granite benchtops. 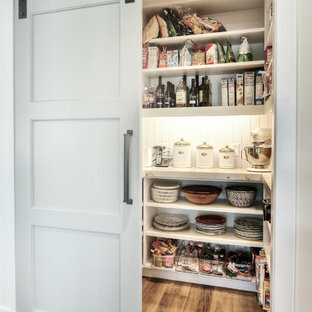 Design ideas for a traditional kitchen in Chicago. Inspiration for a contemporary kitchen in Minneapolis. 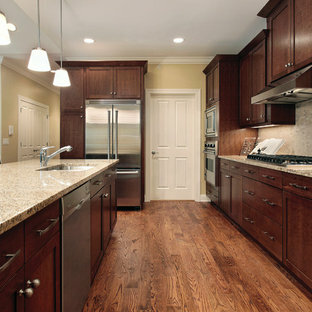 Photo of a mid-sized traditional separate kitchen in Other with dark wood cabinets, granite benchtops, ceramic floors, an island, beige floor and brown benchtop. Large country u-shaped eat-in kitchen in Houston with shaker cabinets, white cabinets, grey splashback, stainless steel appliances, dark hardwood floors, brown floor and an island. 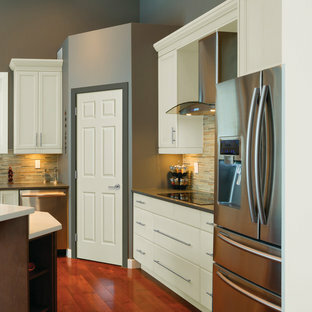 This is an example of a traditional kitchen in Other with stainless steel appliances and subway tile splashback. Design ideas for a large contemporary l-shaped eat-in kitchen in San Diego with flat-panel cabinets, medium wood cabinets, wood benchtops, panelled appliances, medium hardwood floors, multiple islands and brown floor. Country kitchen in Los Angeles with a farmhouse sink, shaker cabinets, green cabinets, quartz benchtops, stainless steel appliances, light hardwood floors and an island. Thorsen Construction is an award-winning general contractor focusing on luxury renovations, additions and new homes in Washington D.C. Metropolitan area. In every instance, Thorsen partners with architects and homeowners to deliver an exceptional, turn-key construction experience. For more information, please visit our website at www.thorsenconstruction.us .